Happy to be sharing with you another great boy themed party (although can be used for a girl also). It was for Milo's 6th birthday and the colours his mother suggested were black white and green. I've seen a lot soccer themed birthdays and while I love the colours, I wanted to add a little more oomph to it, which is when I added a hint of red! So with soccer balls and green grass spinning around in my head, I designed water bottle wrappers, gift tags, stickers, signs and cup cake flags keeping with the KISS principle - keep it simple, stupid! 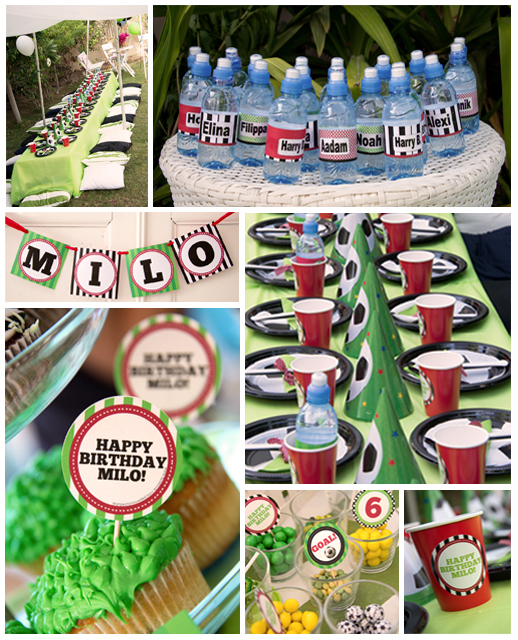 Had a blast designing all of it especially the welcome sign that said 'Let's kick off Milo's party' a sign on the food table that said 'Hope you're having a BALL! ', and the gift bags that said 'GAME OVER!'. 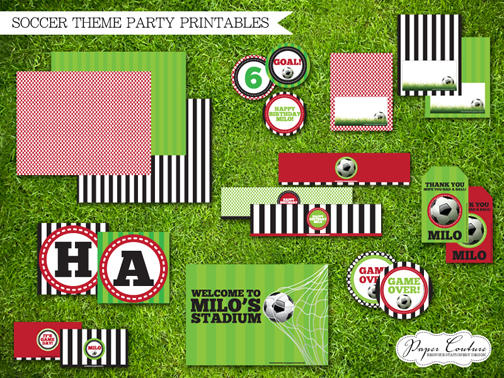 Below are a few pics from the party and the printable stationery set. Hey Sangeeta, these are gorgeous! All the best !